NOTES: massive hovertank with 5 figures and accessories. Armament seems to change a bit, but is mostly centered around the mini-gun on the commander’s cupola. 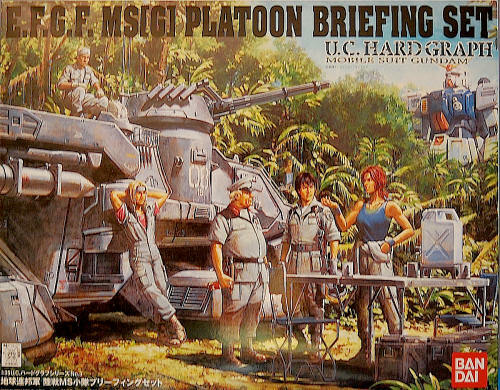 The use of a hover craft support vehicle in the jungles of Asia seems a little odd to me, you’d think they would get hung up a lot. On the other hand, you’d be able to haul a lot of equipment and troops easily over the muddy ground during the monsoons, where a tank would just get bogged down. Huge box=huge kit ! I am not going to unpack the sprues until construction begins, as confusion would quickly set in. This is definitely a kit to make up in sub-assemblies. The directions are in Japanese, but the incredibly detailed illustrations Bandai is so well known for make the long process look fairly easy to tackle. Definitely not a weekend build ! The plastic is virtually flash free. Since Bandai kits have a sort of “snap tight” fit to the parts, you will want to either remove locating pins, or hollow out the reception points prior to assembly. If you like ‘em big and sci-fi, you will love this kit. Thanks to HobbyLinkJapan for the review model !